Léon Maurice Pitoy was born in 1874, in Fontainebleau, France, son of Eugène, a grain merchant. In 1892, he completed a B. ès Sc. degree ('Baccalauréat universitaire ès Sciences', the French equivalent of Bachelor of Science) at the University of Paris, after which, in 1895, he finished his L. ès L. degree ('Licence ès Lettres') from the same University. 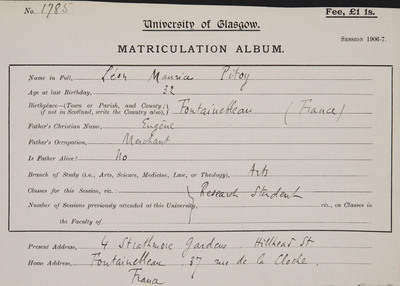 In 1904, at the age of 30, he became an assistant at the French Department of the University of Glasgow, under the supervision of Charles Martin. In a letter from June 1907 to the Principal, Charles Martin explains that for four years, Pitoy has devoted all his energy to helping his students, and describes him as educated, qualified and modest. While a French Assistant, Pitoy also became a Research student at the University from 1906 until 1908. His research subject focused on the Reciprocal Influences of English and French Literature in the Eighteenth Century. This research went towards his MA, which he obtained in 1924. In 1914, he was appointed Lecturer of French at the University of Glasgow. By 1922, he had married Mary Clow Cameron, also lecturer in French at Glasgow, thus becoming the son-in-law of Murdoch Cameron. After 23 years of lecturing, Pitoy resigned his position in 1937, and in 1938 founded the Pitoy Prize, an award to the student considered to be the most proficient in Spoken French at the Final Degree Examination for Honours. Pitoy went on to become Sergeant in the 34th Imperial Regiment of the French Army, which gained him the Chevalier Légion d’Honneur distinction. He died in November 1954, at the age of 80, in Ayr, Scotland, and both he and his wife are buried in the Glasgow Western Necropolis.